Pioneer Seafoods was featured in a very good article entitled “Coming to a menu near you – groundfish? in the Mercury News in April 2019. 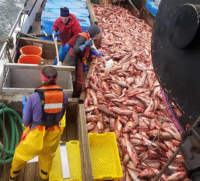 This article talks about how the west coast fisheries have recovered, but the market for these delicious groundfish like Rockfish, Lingcod, Petrale Sole and others has greatly diminished because of lack of availability. Now that great quality, super fresh, local and sustainably caught fish are becoming available again, we need to remind restaurants and shoppers of the tasty, healthy protein source that they may not think of. “San Francisco used to be the hub of the West Coast fishing industry,” said Giuseppe “Joe” Pennisi, the founder of family-run Pioneer Seafoods, who sells groundfish both to distributors like Real Good Fish and directly to customers off his boat at Fisherman’s Wharf. Today, the number of fishing boats in the San Francisco area have dropped significantly. When asked why he stays in such a grueling profession, Pennisi harkens back to his deep fisherman roots.